There are many debt collectors who may use deceptive tactics or blatantly break the laws to coerce you into paying a debt you owe. 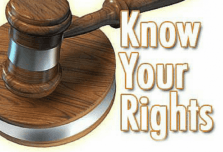 As a consumer owing debt and receiving contact from a debt collector, you have a multitude of rights listed under the Fair Debt Collection Practices Act. These rights, if violated, are subject to penalties/fines against the collection agency for which the debt collectors are calling from. are violating the FDCPA laws. Debt collectors cannot call your relatives or friends and inform them of a debt that you owe. The only purpose for which a debt collect can call them is to obtain a phone number or address for which to reach you. Should a debt collector inform your friend or relative that you owe a debt, they are in violation of your rights. subject to penalties under these laws.